This singularly beautiful neoclassical mansion was built by a lumber baron in 1903 and has been home to the Schoenberger family for nearly half a century. Featured in Grand Homes of the Midwest and Historic Homes of America, this elegantly furnished bed and breakfast is endowed with exquisite woodwork, magnificent chandeliers, five fireplaces, a black walnut library and a mahogany music room with a Steinway piano. Each of the five bedrooms has its own private bath and airconditioning. The Schoenberger House is within walking distance of Lake Michigan, and is just minutes from the city marina, car ferry and the majestic dunes of Ludington State Park. Rates from $145-$245. Visa/MC/AMEX accepted. Smoke-free. 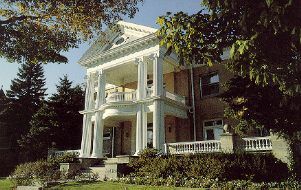 This and other Ludington Bed and Breakfast Inns can be found here in The Register.